...the Commission approved preliminary and final site development plans for site improvements and perimeter security for Federal Office Building 8 located at 200 C Street, SW. The General Services Administration (GSA) plans to convert the Modernist-style building—constructed in 1965 as laboratory space for the U.S. Food and Drug Administration—into office space primarily for staff of the Legislative Branch. At its January 2010 meeting, NCPC approved preliminary and final building plans for the building’s renovation. The plans propose to transform an existing surface parking lot located along C Street into a landscaped plaza that would provide an entry forecourt into the building. The plans also call for using hardened street furnishings as perimeter security elements around the building’s four sides. These furnishings include benches, bike racks, bollards, streetlights, garden walls, newspaper boxes, and trash receptacles. The perimeter security plan presented today responded to previously unfavorable comments made by the Commission at its October 2007 meeting. The Commission noted that GSA worked with NCPC staff and with other federal and local agencies to ensure that the new perimeter security elements will be successfully incorporated into the urban landscape with little impact on the surrounding public space. The landscaped plaza will result in a 43-percent reduction in impervious surfaces north of the building, and the proposed plan increases the number of street trees from 15 to 35. The site will also accommodate storage for 100 bikes. Proposed perimeter security elements include steel bollards that are mostly made of recycled content. It's supposed to be a nice weekend, so I plan on taking some photos around the neighborhood, including 200 C Street. 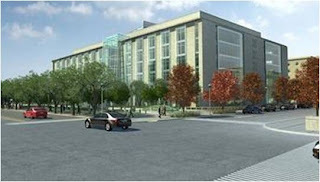 Above is a rendering of the renovated building, from the WBJ website. Update: Below is a photo of the 200 C Street building.